Following the total sell-out of the Bulleid diesels within two months of delivery, the Kernow Model Rail Centre have today announced that in response to customer demand a further batch of Bulleid diesels has been arranged. You can read my review of the first batch here. This batch will feature the same four models as the first batch with two additional versions added. The first four will be certified limited editions of 150 pieces and will be supplied with numbered certificates of authenticity and an appropriate named train headboard. The headboard will be supplied loose in the box for customer fitment. The remaining two models will feature 10201 and 10202 in BR Green with Late Crest and a grey roof for the first time and are not limited editions. The other side of 10201. 10101 and 10202 in black. As previously, these models will need to be paid for in advance to obtain the prices shown below. To reward the loyalty of our customers who previously pre-ordered these models a special offer will be sent to them direct. If customers wait until they arrive they will pay a higher price, assuming they have not sold out prior to release. The models will be £179.99 for DCC Ready or £309.99 for DCC Sound Fitted. By paying in full immediately customers will save £10 (£15 for DCC Sound fitted versions). Delivery is expected in the 1st Quarter of 2019. Please visit the dedicated Bulleid Diesel page on the Kernow Model Rail Centre website here for further information or to place your order. There has recently been a flurry of activity in the Ready to Run world from various manufacturers / model commissioners and this post is a quick update on a number of models that I had the chance to take a look at, run and photograph at the Hornby Magazine Great Electric Train Show (GETS) on their Twelve Trees Junction layout, that I was helping to operate last weekend. Further posts giving a more detailed photographic review of some of the production models about to be delivered will follow in due course. First announced in September 2016 as being part of their 2017 range the ex ex SECR / SR Wainwright H class 0-4-4 tank is progressing well and the first of the production samples can be seen pictured left. No 31518 in lined black with late crest is Hornby catalogue number R3539 and is also pull push fitted. She ran very nicely on Twelve Trees Junction layout over the GETS weekend. Also being released are R3538 as No. 308 in full SECR livery, R3450 as No 1234 in lined olive green and No 31551 as part of a train pack with pull push set 602. Although only announced last month progress on the twelve livery versions of their ex SECR / SR Wainwright P class 0-6-0 tanks is progressing at pace. They have now received in the last week the first livery samples and three of these can be seen left, with all able to seen on the Hatton’s website project update page here. Shades of a 1960s LCGB railtour the P Class tank along with a Hornby Adams radial tank. The Kernow Gate Stock can also be seen in the background. These are of course the first livery samples and a few tweaks are still to be made but the excellent attention to detail on these models can be clearly seen. Shades of a 1960s LCGB railtour the P Class tank along with a Hornby Adams radial tank. The Kernow Model Rail Centre Gate Stock and O2 can also be seen in the backgroundThe full details of the available versions and pre-order details can be found here. Although being livery samples these were unpowered we could not resist running one the samples as a double header to possibly represent a Locomotive Club of Great Britain railtour in the 1960’s. The ex London and South Western Railway pull push Gate Stock has featured on this blog often and now that they have been produced and awaiting shipment from China a small number have been air freighted to the UK for magazine review samples etc. The BR Lined Crimson set 363 (K1003) can be seen left. Three other livery versions are being produced, namely: K1001 Set 374 SR Lined Olive, K1002 Set 373 SR Malachite, and K1004 Set 373 BR Green (plated) See here for more details. Although announced some time ago, the necessary research for the production of the CADS for these diesels with their complex multiple curved exterior shape has as already documented taken much longer than planned. When last year additional information came to light the development process moved on at a fast pace and now production of the first versions has now been completed. The model ran exceptionally well on Twelve Trees Junction hauling a long rake of twelve wheel Pullman coaches with considerable ease, due to its good weight and a centrally mounted 5 pole motor with flywheels powering each bogie. Both an example of the the Gate Stock, the Bulleid diesel 10201 and as an exclusive, their first running Engineering Prototype of the Western Region D600 series Hydraulics, also being produced by the Kernow Model Rail Centre will be running on the High Wycombe and District’s Hinton Parva layout this weekend at the Warners / BRM Magazine National Festival of Railway Modelling. if you are planning to attend come and say hello to the Hinton Parva team. Regular readers of this blog will know that this time of year I tend to head south to where ‘summer comes soonest’, to coin a phrase from that well know Southern Railway Publicity poster. I am soon heading very South (well about 4 and bit hours and approximately 1600 miles in a plane south) for a blend of Spanish, African and Latin American influences, exploration including a dormant volcanoes and a lavascape, rest, relaxation and hopefully some sun, possibly dark sandy beeches and sea too (might help you guess where). Normal service on this blog will therefore be resumed at the end of the month. Before I get in to full holiday mode I just thought I would give a couple of brief updates on a few Southern related model items. Firstly, Dapol have now released images of the first assembled Engineering Prototype of their 00 gauge ex LSWR B4, announced back in 2014, This follows on the tooling test pieces that they had on display back in March at the BRM / Warners / MRC London Festival of Model Railways . So far the EP of just the one version of the 5 variants promised has been shown but I believe the other variations will follow. Dapol B4 EP rear 3/4 view. Secondly, The Kernow Model Rail Centre have received the second batch of livery samples of the their Gate Stock Pull Push sets and also the first main livery sample of the Bulleid Diesel numbers 10201 and 10202. With respect to the Gate Stock there are still a number of tweaks being made to finalise the liveries. Although the first EPs of the Bulleid diesels broke cover, like the Dapol B4 tooling samples, back in March at the BRM / Warners / MRC London Festival of Model Railway as reported here, the livery application upon them had been undertaken by the factory from their own research rather than against approved livery artwork. The samples now received still have a few minor corrections to be made as the running numbers and BR early emblems are placed too high on the bodyside. The bogies require the axle boxes and springs painting black and the wheels will be the correct Bulleid pattern rather than the simple wheels provided for testing purposes. (The first engineering sample had the correct wheels). It should also be noted that these models have a centrally positioned 5 pole motor (not coreless) with two brass flywheels driving each power bogie via flexible drive shafts and having had the chance to test run the first EP they have a good weight to them, are quiet, smooth and powerful. Kernow Model Rail Centre have also confirmed details of the final pricing and ordering details with respect to the pre-orders and this information can be found on the Kernow website here. The 10203 versions will follow later. Production slots for both the 10201 /2 Bullied Diesels and the Gate Stock are currently being finalised but it is hoped should be by the end of August, which neatly gets us back to summer and holidays how this post started. Making Quay progress, Canute Road Quay nears completion… if such ever happens.. Since my last post showing progress on Canute Road Quay, with respect to the concrete road area and inset trackwork along with making the grass ‘grow’ I have been busy completing the rest of the buildings and adding a mix of details. The two main front buildings have been assembled from the excellent laser cut card components from LCut Creative these have now been initially painted and external details such as gutters and downpipes added from a mix of Peco LK-78 buifdings details pack and Wills SS46 Buildings Pack A. These buildings are not yet permanently affixed to the layout as I am still to add the internal details and also some lighting. I gave the LCut Creative buildings a coat of Humbrol grey acrylic primer prior to dry brush painting the brickwork using a pallet of brick work colours from Precision Paints mixed with a little dirty black and also picked out slightly different brickwork such as the window brick arches a slightly lighter colour. The main warehouse loading platform has been made using Wills floorboard building sheets rather than the LCut Creative card items as I was making the platform quite long and the Wills plastic sheets are larger and stronger. This has been painted a weathered greyish brown colour. To give access to the upper floor loading doors I have created a gantry hoist supported on the quayside by an ‘A’ Frame. The block and tackle / pulley would run on the smaller section ‘H’ girder mounted below the main cross girder, to either lift items to and from open wagons and or in theory the girder would be cantilevered over the quayside to lift items from moored vessels. I have made this somewhat freelance design from scratch using two different sizes of brass ‘H’ section soldered together with some corner bracing details added from thin brass sheet embossed with a number of rivets. The engine shed tucked away in the back right hand corner assembled from Skytrex Model Railways resin parts is now complete and suitably painted. The inside floor of the shed has been painted to represent a concrete floor and outside the shed a mix ash, using real ash from my wood burning stove, ballast and coal around the coaling platform, a Hornby Scaledale product, have been glued in place using the usual method of diluted PVA glue. The water crane is a Kernow Model Centre commissioned SR style made by Bachmann Scenecraft. A few people and black wing gulls have been suitably positioned around the layout from Langley Models, I have also used their etched drains and drain covers in suitable places. The SR barley twist post style gas lamps, from Gaugemaster, are yet to be wired in although the transformer, voltage regulator and input wiring is already place to do so. Other details items such as wooden crates, oil drums, sacks and fish crates have been added from cast plaster items from Ten Commandments suitably painted. In my last post about Fisherton Sarum attending the Epsom and Ewell exhibition last weekend, Canute Road Quay makes its first almost public appearance this coming Sunday at an RMweb forum members event in Taunton. I would like to thank all those readers of this blog who came by Fisherton Sarum at the excellent Epsom and Ewell exhibition, it was good to speak to you all. On the whole from the layouts perspective the show went well despite a couple of electrical niggles, and I am looking forward to hopefully a good day with Canute Road Quay on Sunday. At the BRM / Warners / MRC London Festival of Model Railways this weekend Kernow Model Rail Centre have on display for the first time a full livery samples of the Bulleid diesels 10201/2&3. The post also provides very first images of the Bachmann ex SECR Birdcage sets crimson livery sample unveiled at the show for the very first time. I also provide an update on other Southern / Southern Region related RTR work in progress and model news. This follows the recent release of the excellent Hornby original Merchant Navy pacifics, in SR malachite, the BR livery version are due soon, as reviewed in my post here. We look forward to their H class 0-4-4T arriving later in the year as well as tooling is well advanced and livery artwork specifications completed. Although announced some time ago, the necessary research for the production of the CADS for these diesels with their complex multiple curved exterior shape has taken much longer than planned. During last year additional information came to light that has assisted greatly with development progress. I have fortunate to have been party to progress that has been made during the last few months; firstly, with various sets of CADs, initial Engineering Prototypes and now the livery sample versions on public display for the first time this weekend. K2701 Number 10201 in BR Black livery with early emblem. K2701 Number 10202 in BR Black livery with early emblem. K2703 Number 10203 in BR Black livery with early emblem. K2704 Number 10203 in BR Green livery with late crest. The purpose of the livery samples are of course to check the application and livery details, so being the first such samples there are a few known corrections to be made before these can go to production, such as confirming the colour shades, adding lining and changing to the correct late emblem and no interconnecting doors on the K2704 version. These models are fitted with now standard arrangement, for similar diesel and electric models of a centrally mounted motor driving each bogie via drive shafts and a gear tower. There are a number of slight corrections already identified to be made, including the size and weight of the set numbers, running number and Southern sizes and positioning, the droplight colour on the olive green set and handrail colours etc. Yes it is known that in the pictures left the bodies on these samples have been assembled on the chassis the wrong way around and swapped between driving and trailer cars, hence the steps not lining up with the gated entrances, and has since been corrected. K1001 livery sample with Chassis assembled the correct way round! The purpose of these samples is to confirm the liveries (and a small number of corrections made to the body tooling since the last Engineering Prototype) and no further tooling changes are proposed. It is good at last to see further progress made and hopefully once the livery amendments can be made production slots can be allocated. Livery samples have also been received from Bachmann for the 4-TC units, also known as class 491 and later class 438, commissioned by The Kernow Model Rail Centre that were first announced in June last year. Bachmann in 00 gauge have a number of SR related developments as work in progress at the moment. The highlight at the show was the first appearance of the first livery sample pf the ex SECR Birdcage sets. SR Olive Green and BR crimson. Bachmann having now received and showing the BR crimson version so far, with the other slightly more complex liveries to follow soon. The expected delivery dates are currently September / October. No further news on the progress, other than being at the R&D stage, of the Class 414 2-HAP or Class 410 4-BEP EMUs, or the Ransoms and Rapier 45T steam cranes at the moment. In N gauge the Graham Farish C Class 0-6-0 announced earlier this year is in the R& D stage along with the Class 319 EMU whilst the SECR Birdcage coaches are in the drawing office. 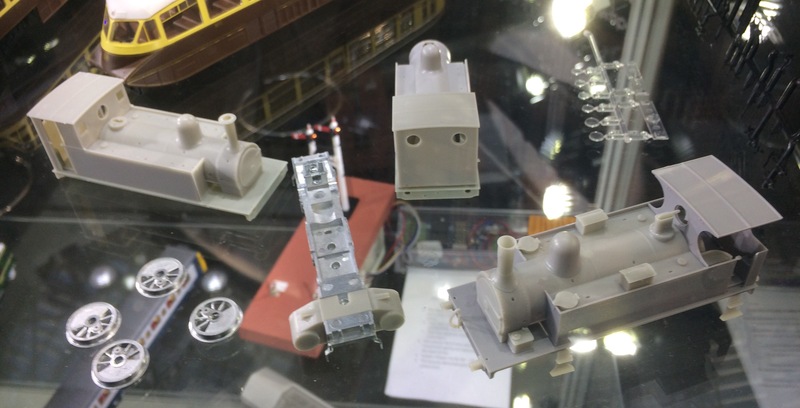 Dapol have confirmed that the N Gauge 4 compartment Brake Third and the Brake Composite are still to be released in the Summer and will not be impacted by the recent announcement. [update 26/03/17] I can confirm that this not affect the 00 gauge ex LSWR B4, announced back in 2014, as this is in tooling and the had some of the first test pieces on display. I am pleased to show on this post the progress made on the Kernow Model Rail Centre ex LSWR Gate Stock sets, with some pictures and video of the 2nd Engineering Prototypes (EPs). The purpose of such EPs are to check the toiling and the options within tooling to represent the variations being produced. Although some will feel that it has been a bit of a while since both the initial announcement back in 2011 (but please bear in mind the manufacturer has changed in that time and the resources available to Kernow Model Rail Centre for such commissions) and the tooling starting for the first Engineering Prototypes (EPs) at the end of 2014, I can assure you that work and modifications since the first EPs have been undergone in that time to try and ensure the greatest of accuracy within the production constraints and costs of producing such models. With thanks to Kernow Model Rail Centre I have been able to have a look over the EP of their K1002 which will eventually be Set 373 in Southern unlined malachite green. There will also be three other variations of the 1914 Gate Stock namely: K1001 Set Number 374 in lined Southern Olive Green, K1003 Set 363 in BR lined crimson and finally K1004 in BR Green with tooling to reflect the additional steel plating fitted to this set for this period. All are as per their condition post being modified by the Southern Railway around 1929/30 to their adopted air control (as opposed to mechanical via wires and pulleys) and the driving cab changed to the standard SR 4 window style. 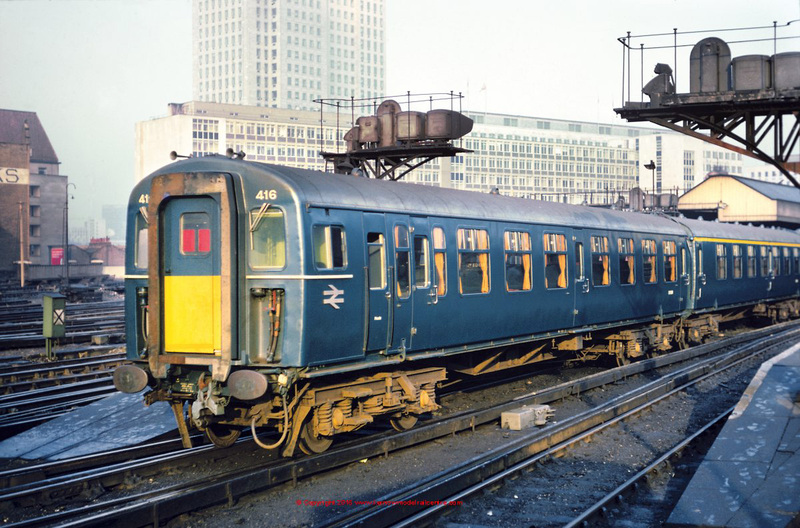 Although it would be nice to have been able to produce a variant in original London South Western Railway (LSWR) condition the commercial consideration of possible sales verses the additional tooling costs precluded such an option (but I am sure some talented pre-grouping modellers might be able to do a conversion and I can provide details / reference information if required). The video below taken on the Hinton Parva layout of the High Wycombe and District MRS and shows the set running pushed and pulled through a series of point work. There are still a small number of known additions and slight corrections to be made to the tooling, but these models are really looking the part, all versions of the EPs are being checked over to pick up any other minor corrections needed and extensively test run. Once these tests have been completed and Kernow Model Rail Centre are happy with the running qualities we will move to decorated samples. The livery artwork is being worked on at present and I have provided some advice to assist Kernow Model Rail Centre with this, they have already completed the box design. An actual delivery date can not be given at this stage as this will only be known once livery samples have been approved and the model is actually in production. All the 2nd EPs will be on display on the Kernow Model Rail Centre stand number A75 at the Warley National Model Railway Exhibtion at the NEC this weekend. I will also be at the Warley Exhibtion all weekend as the ‘unhired’ help playing trains on the Hornby Magazine‘s latest layout Grosvenor Square (just turn a blind eye to the fact that it is a BR Western Region!) on stand A36 so please come and say hello. Look out for a post show report of anything of a Southern / BR(s) interest that crops up. Kernow Model Rail Centre have today announced that they have been working with Bachmann to produce the Southern Region 4-TC unit, also known as class 491 and later class 438, that were usually propelled by 4 REP EMUs, Class 33/1s and also Class 73s, Class 74s and other compatible 1951/57/63 built EMUs. Although the 4-TCs were un-powered the Southern Region regarded them as Electric Multiple Units. This model, although based on the existing Bachmann Mk1 design, actually required three totally new tools to produce the four car unit along with their correct bogies and therefore is the equivalent of tooling three completely new locomotives. Despite this Kernow Model Rail Centre have managed to keep the price of the unit to £289.95, which is reduced to £269.95 if you place a pre-order before the model leaves China. The first Engineering Prototype (EP) sample has been received and a few tweaks are required, such as moving the headlight to the correct position and re-configuring the wiring to allow the unit to be connected in the correct formation. The units will feature working internal lights and the head and tail destination blinds also illuminate. Separate connecting doors are provided to give variations in headcodes, similar to the previous Bachmann 4-CEP. The unit is wired throughout using connectors similar to the Bachmann Blue Pullman, which allows full electrical connectivity while also allowing relatively easy uncoupling when required. Switches below the unit allow the internal lights to be switched on or off, and also allow for independent switching of the destination blinds at the front and rear of the unit. The model is fitted with a 21 Pin DCC Decoder socket and also has provision for DCC Sound fitting. One decoder is required for DCC operation and is fitted within the luggage compartment of the Trailer Brake Corridor Second (TBSK) vehicle. The switching arrangements for internal unit lighting are replicated for DCC and can all be controlled from the single decoder. The 4-TCs were converted from Mk1 loco-hauled coaches, with 31 units converted in 1966-7 by British Rail Engineering at York Works. Initially 28 x 4 car units were created with 3 x 3 car units. The four car units were formed Driving Trailer Second Open (DTSO), Trailer First Corridor (TFK), Trailer Brake Corridor Second (TBSK) and Driving Trailer Second Open (DTSO). The 3 car units omitted the TFK. Summer services to Weymouth were frequently overcrowded so in 1974 a further 3 x 4 car units were converted and at the same time the 3 car units had a TFK inserted to make them up to 4 car units. When the route from London Waterloo to Bournemouth was electrified in 1967 there was insufficient funds to complete the electrification of the route through to Weymouth. An alternative method of operation was designed with high-powered Class 430 4-REP units propelling one or two 4-TC units from Waterloo to Bournemouth. At Bournemouth the 4-REP would be detached and a Class 33/1 Diesel Locomotive would be attached at the Weymouth end to haul either one or two 4-TCs through to Weymouth. In the reverse direction the 4-TCs would be propelled from Weymouth to Bournemouth where the 4-REP would then haul the 4-TCs to Waterloo, leaving the Class 33/1 at Bournemouth to await the next Weymouth service. The usual area of operation of these versatile units was between London Waterloo and Weymouth, although they could frequently be seen throughout the South Western division of the Southern Region. Regular duties included the Kenny Belle peak shuttle service between Kensington Olympia and Clapham Junction. They were also used extensively on West of England line duties between Yeovil and Salisbury to London Waterloo and between Reading and Portsmouth Harbour. Until the closure of the Swanage branch they worked on through trains from London Waterloo. Railtours saw the units make trips to varied locations throughout British Rail, including Birmingham, Cardiff, Meldon and Barnstaple. With the electrification of the entire Weymouth line complete by 1988, along with electrification of other South Western division routes, the need for the 4-TCs was removed and most were withdrawn by 1990. Two units were retained and repainted in original blue livery, albeit with larger yellow warning panels, with the intention to use them for “Premier Charters”, a role which they performed until 1994. 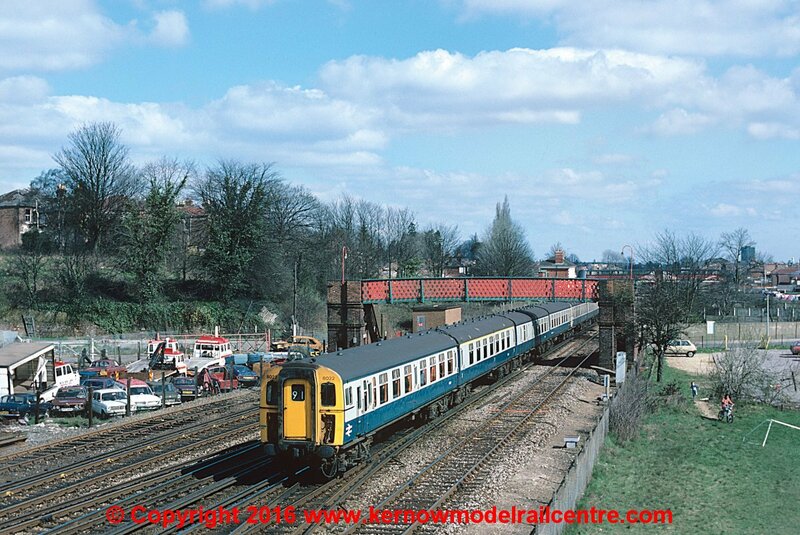 All images on this page are courtesy of and copyright of Kernow Model Rail Centre / Chris Trerise.